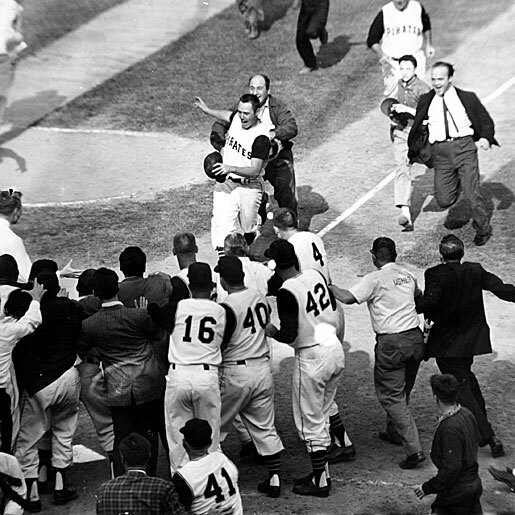 I'd imagine most of you have already heard about the story of the 1960 World Series Game Seven videos recently found in Bing Crosby's wine cellar. But today, the city of Pittsburgh got some exciting news about the next step for that long-lost footage. Brian O'Neil of the PG reports that the game footage will "debut" in its entirety at a Pittsburgh theater in November at a special event hosted by Bob Costas. The star-studded guest-list to be held at a yet-to-be-determined destination will include living Pirates and Yankees who played in the game, members of the Crosby family (Bing's, not Sidney's), and Pittsburgh-bred athletes such as Joe Namath, Mike Ditka, and Dan Marino. How retired football players work their way into the festivities at a baseball event like this is anyone's guess, but the more, the merrier I suppose. Footage of the night, which will include on-stage conversations between innings, will then be used for a national MLB broadcast in December, and a DVD will also be produced. The only sad part of this is that it's the most exciting baseball game coming to Pittsburgh in 2010 - and we already know the outcome. So it took looking through the wine cellar of a man that's been dead since 1977 for Pirates fans to experience playoff baseball again.